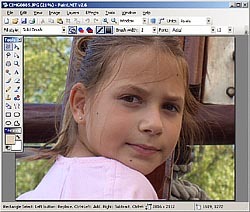 How to prepare your personal photos for the transformation into quality cross stitch chart. correspondence table of the references DMC and ANCHOR. How to prepare your photos before sending them, for a better result! To work over again a photo, I advise you to download, install and familiarize you to a free software of final improvement of image like paint.net (http://www.eecs.wsu.edu/paint.net/) : Download Paint.net 2.6. 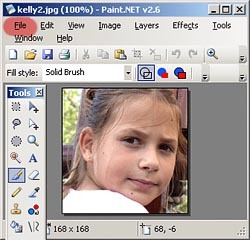 The example below explains you what to do, step by step, with this software to prepare your photos for the transformation into a pretty cross stitch chart and easy to realize. open your photo in the menu File > Open. go to search your photo in the good folder and click on the Open button. 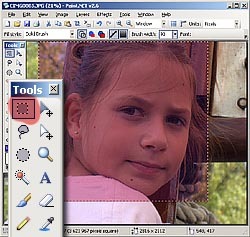 begin to resize your photo to keep only what is important. For that, click on the Rectangle Select tool in the pallet of tools (Tools). select on the photo the rectangle representing the zone to be kept. click on the point high left of the rectangle and drag the mouse by keeping the button supported towards the low side right of the rectangle. 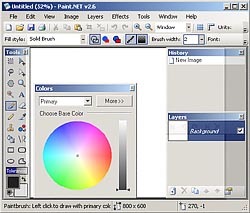 Resize the photo in the menu Image > Crop to Selection. resize the photo with good dimensions. For that, calculate the number of points in width or height of your finished work by multiplying the size of the work in cm by the number of point per cm of the fabric used. Let us take as example a chart of 30cm by 30cm on a flax fabric AIDA of 5,5 points per cm. You just need to multiply 30cm X 5,5 points per cm that gives us 30x5.5=165 points of width. 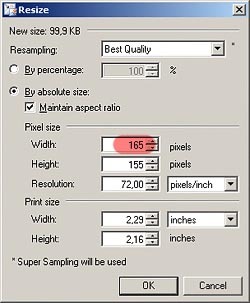 defer this calculation in the menu Image > Resize . A too dull photo will never give a beautiful grid of cross stitch. 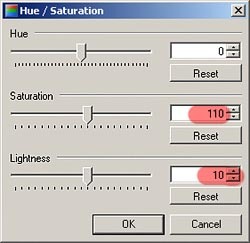 Change the parameter Saturation between 105 and 115.
and the parameter lightness between 5 and 15. Adjust parameters according to the result on the photo. a photo enough contrasted will never give a beautiful grid of cross stitch. 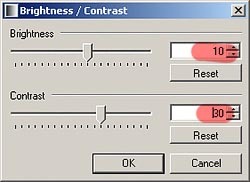 Change the Brightness between 5 and 15.
and the Contrast parameter between 20 and 40. Your photo is now ready to be saved. Select the folder and the file name of the backup file of the image. 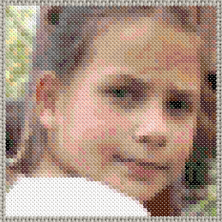 select this new image file in the form of the site to transform it into cross stitch chart.